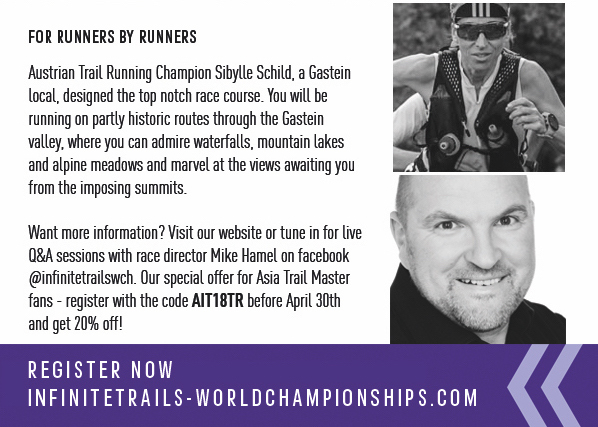 EXCLUSIVE - Join the Adidas Infinite Trail World Championships Relay in Gastein, Salzburger Land, Austria from 22 to 24 June with a 20% discount on the registration fee! 333 Teams of 3 runners each will battle for the world title in an exquisite mountain setting over a total distance of 124 km and 7100 hm. Before the championship race, there is also a mandatory prologue race for ALL participants on Friday: a vertical run of 18 km and 1500 hm, which will determine the starting order of the relay world championship race on the weekend. So if you're looking for a special kind of new trail experience in Europe this summer: look no further. We recommend flying to Munich airport in southern Germany, but Salzburg, Innsbruck and even Vienna are alternative international airports. AIT18TR , available until 30 April. The top 3 of the 2017 Asia Trail Master Championship have received a special invitation to this event. We are happy to provide this great opportunity to our runners.